It was drizzling that night much the way I always assumed it would in London. This is Texas, though, and here water is usually a welcome thing. 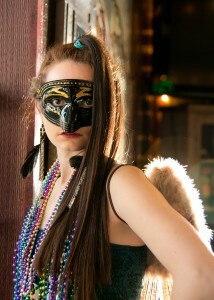 The air smelled great and I was full of creativity as I donned my masque, my tail and my wings. I was ready for the party. Mardi Gras might be on a Tuesday, but here in Mansfield we were celebrating early with Jim Suhler and Monkey Beat followed by Jason Elmore and Hoodoo Witch. So it was Saturday night and I was dressed as the perfect pegasus. I headed with confidence to the Farr Best Theater only to discover that the party was starting across the road. Down to the crosswalk I went, arriving just in time to miss my chance to cross. The intersection there is two lanes headed in both directions so I had to cross four lanes of traffic to reach the safety of the sidewalk on the other side. I pressed the walk button and impatiently waited for the pedestrian walk light to inform me it was safe to cross. I had a moment there where I seriously considered crossing against the advice of that pedestrian sign, but decided I should just play it safe and wait for that little blueish white man to beckon. 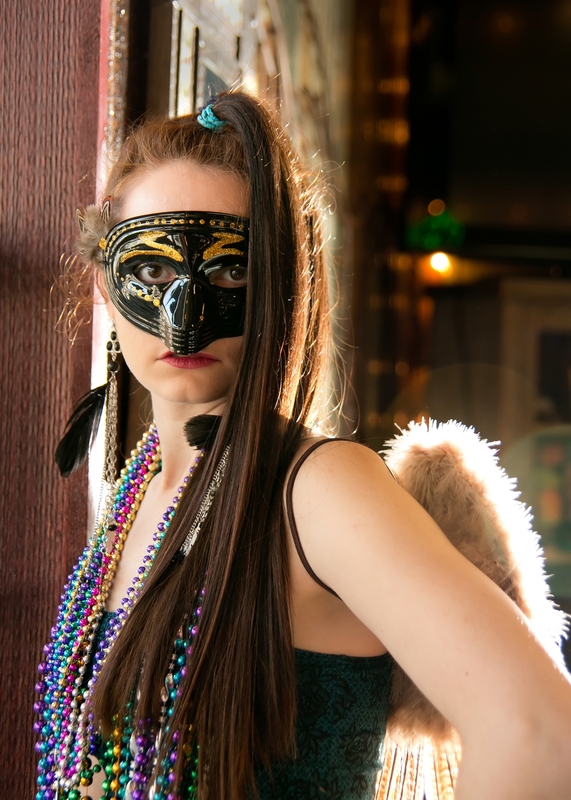 When he did, I confidently strutted my runway walk down the crosswalk, aware that there were probably people staring at me in my little flirty skirt and knee high boots (not to mention the beautiful feathery wings) as they waited for the light change. It’s not every day you get to see a person in full masquerade costume proudly cross a street. I remember realizing that I was no longer upright and deciding that I’d fallen off my heels. (Hey, it happens to the best of us.) While trying to catch myself from falling my brain ran a diagnostic and reported that my ankles hadn’t turned, so it would have been impossible for me to have fallen off my heels. That was when I realized that I was on the hood of a car. In the split second that followed I remembered playing Saints Row III which reminded me that it would be far safer to slide off the side of this hood than off the front. My attempts to scramble to the side were no match for inertia and I slid to the pavement in front of the car that had just hit me. Terrified that the driver would be unable to see me in my prone position, I sat up as tall as I could. I then realized that another car could be coming through the intersection at any time and began to pull myself toward the sidewalk out of self-preservation. If the car that just hit me was rear-ended, I would be hit again and unable to save myself. Such a simple statement. So rife with meaning. I had no broken bones. So significant. So often taken for granted. The whole thing rearranged my life. Here I am, not a full week later. My injuries are invisible given the right clothing, but I can’t even lift the water pitcher to pour myself a drink. Today I was able to brush my hair by myself for the first time. I’m a professional musician, but I’m unable to lift my lap harp to play. Everyone is beautiful. Every child I see is perfect. I tell every family member I see that I love them. I get that country song about skydiving stuck in my head at weird times. I finally tackled my fear of wordpress and wrote this blog. I can barely sit up more than an hour and a half. I break down and sob at 30 second intervals with no warning. I survived what killed my teacher. He was world renowned. He was a genius in his field. He was wise and he was kind and he was special and about 14 months ago someone hit him with their car outside the train station causing his death not long after. But I survived. What do you do when the cosmos seems to be indicating there is more left to do with your life? You face your fears. You chase your dreams. You love people. You learn from your mistakes and you try to pass it on. You reach down deep inside of you and discover you’ve always known how to fly. I’m the girl with the wings and I won’t be invisible anymore. Stick around. Let’s see what happens. This entry was posted in Uncategorized and tagged costumes, freak accidents, life. I just found this. God must have something special for you to do. Sorry for the pain but it reminds us we are and able to thank God for each breath.